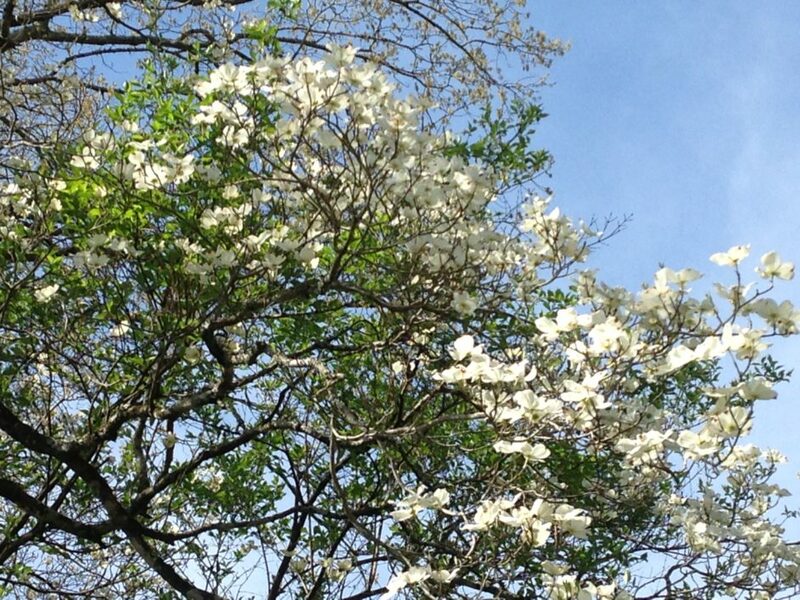 There may not be documented proof that Dogwood Arts has been responsible for coaxing a bazillion – or even a billion – blooms out of Knoxville’s dogwood trees, but it is certain that the Bazillion Blooms tree-planting program will reach its goal of 10,000 trees in 10 years by December. The 10th-annual community-wide planting day will be Saturday, Dec. 1. Since Bazillion Blooms launched in 2009, Dogwood Arts, with the support of community and corporate partners, has planted more than 9,600 disease-resistant, April-blooming dogwood trees. Dogwood Arts fever has already started in South Knoxville. Vicki Baumgartner, DA’s program manager for Trails and Gardens, spoke Oct. 11 at the Colonial Village Neighborhood Association meeting at the South Knoxville Church of God. Chapman Highway Dogwood Trail co-chairs DeDe Wilkerson and Susan McKinney were also on hand. Wilkerson and McKinney met with Baumgartner prior to the meeting to discuss proposed expansion of the Colonial Village and Lake Forest sections of the trail. With Lindbergh Forest already announced as joining the Chapman Highway trail next April, it could grow from 3.5 to 10 miles. Next Thursday, Oct. 18, Molly Gilbert, former chair of the CHDT committee, will speak to the Chapman Highway Garden Club and the Old Sevier Community Group. Peggy Tubbs, a longtime chair, rounds out the four-person committee. SoKno trails also include Island Home Park and Lakemoor Hills. Wilkerson, who is the overall Trails Chair for Dogwood Arts, has already created a Chapman Highway Dogwood Trail Facebook page. The committee also plans to deliver a letter to every new resident along the trail with information about things like what trees and shrubs would be good to plant. “We’re trying to energize the community, and we’re trying to get people excited about cleaning up their yards and doing good things for South Knoxville,” says Wilkerson. The Bazillion Blooms program encourages community members to plant not only dogwoods, but also flowering trees and shrubs, bulbs and perennials during the fall gardening season so that they can develop strong root systems over the winter that will help them thrive as hot weather descends. Dogwood Arts is selling disease-resistant dogwood trees at dogwoodarts.com or by phone, 865-637-4561, through Nov. 16. The 2-foot to 4-foot bare-root trees are available for $25 each or five for $100. The trees ordered must be picked up between 9 a.m. and noon on Saturday, Dec. 1, at the UT Gardens off Neyland Drive. Larger blooming trees, flowering shrubs, bulbs and perennials will be available for purchase at participating Bazillion Blooms garden centers this fall, including Stanley’s Greenhouse & Plant Farm, 3029 Davenport Road, 37920, 865-573-9591; Ellenburg Landscaping & Nursery, 722 Vanosdale Road, 37909, 865-769-5677; and Wilson Fine Gardens, 5805 Walden Drive, 37919, 865-603-4002.